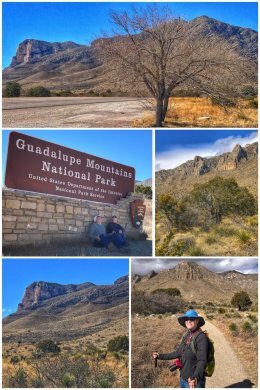 Our last stop in New Mexico was in Carlsbad, in the southeastern part of the state, and known as the gateway to the amazing Carlsbad Caverns National Park, but also a great location to slip into Texas and visit the Guadalupe Mountains National Park — which is just what we did! 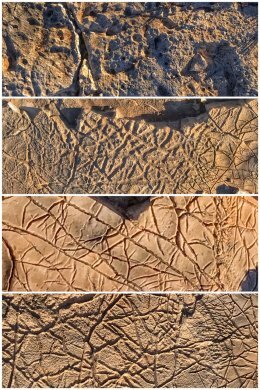 We actually started this adventure with a drive into western Texas and into the park that protects the world’s most extensive Permian fossil reef (including the impressive El Capitan shown in the top photo), the four highest peaks in Texas (including Guadalupe Peak, the highest at 8,749 feet), and an environmentally diverse collection of flora and fauna. It also protects McKittrick Canyon, which is supposed to be absolutely amazing in the spring and fall… and all of which was locked down tightly because of the ridiculous 5-week long federal government shutdown. The 86,367-acre Guadalupe Mountains National Park — national park #29 so far on this adventure — was established in 1972 for its scientific and scenic values. It contains 46,850 acres of Congressionally designated wilderness. Part of the northern boundary of the park adjoins the Lincoln National Forest and lands controlled by the Bureau of Land Management (BLM). Some 58 species of mammals and more than 300 species of birds have been seen in the park. The mountain range is an uplifted segment of the Capitan reef, a limestone barrier reef that formed some 280 million years ago from algae in — wait for it — a shallow, tropical inland sea (like so much of the western states we have visited). About 250 million years ago, geological forces pushed the reef above ground. Of course, the shutdown did not deter us from visiting and hiking a few trails that were fairly close to Highway 62. We parked off the highway at the entrance for the Pine Springs Visitor Center and hiked the Pinery Trail, which starts with a fun nature trail with good signage and concludes with the remains of the old Pinery Station (built in the mid-1800s and named for the nearby pine trees), a stop on the Butterfield Overland Mail Route, a 2,700-mile stagecoach route that stretched from St. Louis to San Francisco. From there, we decided to go to the next location in the park, just to the north — and visit the historic Frijole Ranch (also known as Guadalupe Ranch, Spring Hill Ranch, and the Rader-Smith Ranch). 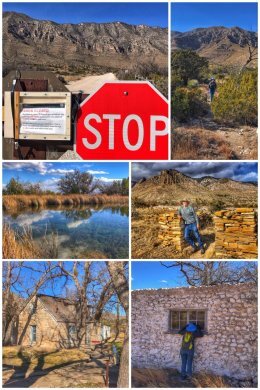 We hiked the Foothills Trail up to the ranch and then continued on the Manzanita Spring Trail, which leads to a beautiful pool, as seen in the photo collage. One can also hike the 2.3-mile Smith Spring (loop) Trail. The missing link for us was the scenic McKittrick Canyon, hidden deep within the Guadalupe Mountains, a rich riparian oasis in the midst of the Chihuahuan Desert… which was inaccessible for us on this trip to the park because of the shutdown. The canyon has been called the “most beautiful spot in Texas.” In both the spring and the fall, visitors will find a profusion of wildflowers, as well as a stream that runs so clear that one can clearly see the rainbow trout swimming below the surface. Groves of walnut, ash, oak, and maple trees grow here. Just 35 miles north of Guadalupe Mountains National Park (and 26 miles southwest of Carlsbad, NM) lies Carlsbad Caverns National Park — also part of the same massive Permian Basin, once flooded by the Delaware Sea. 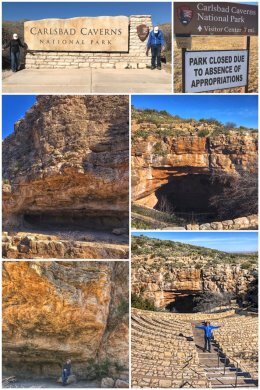 First established in 1923 by President Calvin Coolidge as the Carlsbad Cave National Monument, it became a national park by designation of Congress in 1930 — and it fittingly is national park #30 that we have visited on this wonderful road trip. The park emcompasses 46,766 acres, with more than 33,000 acres designated as wilderness The park features more than 100 caves. While the park’s roads were still accessible, the main feature of the national park — the caverns — were closed because of the shutdown. When open, visitors can take a guided tour with a park ranger or go on one of two self-guided trails. The first — and most popular — is the 1.25-mile Big Room Trail. The Big Room is the largest single cave chamber by volume in North America — and labeled by famed Actor and comedian Will Rogers as “The Grand Canyon with a roof over it.” Your other option is the very steep 1.25-mile Natural Entrance Trail, which is like walking up or down (depending on where you start) a 75-story building. This trail offers vistas of numerous named formations, including Devil’s Spring, the Whale’s Mouth, and Iceberg Rock. Happily, we were still able to visit the main cave’s “natural entrance” — where thousands of bats make a show of flying out in the evenings in search of insects from mid-April to late-October. 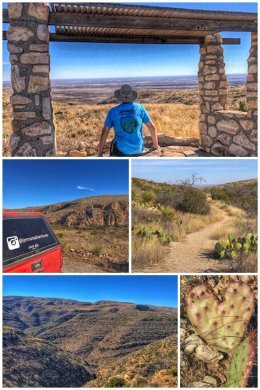 While in the area, we also hiked part of the Old Guano Trail (and discovered a back entrance to the cave), as well as the fun (and mostly paved) Chihuahuan Desert Nature Trail. We also hiked the Walnut Canyon Vista Trail and the Indian Rock Shelter Trail. 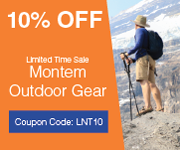 While the views of the surrounding hills and canyons is wonderful on this trail, the most amazing aspect is that you are walking on rocks littered with the fossilized remains from when these hills/mountains were part of the bottom of the sea. For more intense hikers, the park also has more than 50 miles of backcountry trails — but they are minimally maintained and contain no water sources. 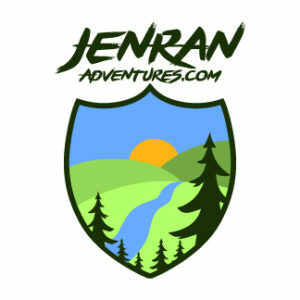 Overnight camping is allowed with a permit. While the western edge of the Permian Basin is protected by national parks, we got to witness first-hand the ugliness of fracking (for oil) along the central and eastern edges of the basin as we headed along Highway 285 through Pecos, Texas, on our way to a quick layover in Fort Stockton. Besides the ugliness of all the machinery dotting the countryside and the questionable practices and chemicals used in fracking, we witnessed backups (luckily going north at the time we were driving south) several miles long. After our brief stay in Fort Stockton (also part of Pecos County) — which included a much-needed wash for our truck, some lovely walks in in historic Fort Stockton, and a little wine-tasting at the Grey Mule Saloon (home of Mesa Winery) — we headed to our next national park adventure in the Big Bend area of southwest Texas. Ironically, located right next to the Fort Stockton Visitor Center (housed in a rehabbed historic railroad depot) is the Fort Stockton Renewable Energy Park, which includes wind turbines and solar panels — and powers the visitor center. While happy to see the expansion into renewable energy, it is also odd given the massive fracking taking place in the region. Previous Post:Stop 71: Alamogordo Adventures!